The 28-year-old Logano is now a champion. Joey Logano wasn’t part of the “Big Three;” he wasn’t part of the gang who won 57 percent of the races this season. But when it comes to NASCAR, and their playoff system, you just need to be the last one standing at Homestead and that’s what Joey Logano did. Amid a mix of strategy and raw speed, the 28-year-old Logano outlasted Martin Truex Jr., Kevin Harvick, and Kyle Busch to become the 2018 MENCS champion. The championship winning move from Logano happened in Turn 1 with 12 laps to go. On the final restart (we’ll get to that later), Logano crept closer and closer to leader Truex. And then going into the turn, Logano unleashed an amazing move entering the turn, made it work and powered past Truex. Crew chief Todd Gordon really set up Logano’s car to work best on short runs, and that final run was just perfect for Logano to make his move and pull away for the win. This race certainly wasn’t easy for Logano or his team. Each of the four took turns in the lead and really looked like they would capture the championship. And each utilized strategy to put themselves in the position to win. Truex, whose Furniture Row Racing team was shutting down after this race, had the lead in the closing stages but didn’t have enough speed for a short run. Early on, crew chief Cole Pearn took to pitting Truex just a lap or two after the others to avoid potential traffic at the cost of track position. He wouldn’t do that at the end but Truex wanted to make sure he was there at the end. Busch and crew chief Adam Stevens’ strategy was set for them after a couple bad pit stops set them back. The last one, the pit gun on the front of the car got stuck underneath the fender and pushed Busch back. Because of that, Busch stayed out and held on the lead praying for a caution as the other three drivers pit early for tires. Then with around 20 to go, Brad Keselowski got into Daniel Suarez in a four wide battle in the turn to put out the last caution and give Busch a chance to win but to no avail. Before that caution, Harvick and crew chief Tony Gibson had used pit strategy on the final green flag stop and jumped ahead of Logano and Truex while Busch ran his own race. Gibson specifically waited until Truex got past pit road before telling Harvick to come down pit road and get the advantage. Harvick needed the race to stay green the rest of the way and if that were to happen, Harvick would be in perfect position to win the championship. But once that happened, and Busch didn’t need to pit under green, and Logano’s short run strength, Harvick was pretty much finished at the closing stages. But at the end of the night, this title belonged to Logano. Logano’s journey wasn’t like the others. For one, Logano was the only driver who hadn’t won a championship before. In addition, Logano only had two wins, and while he was arguably the fourth best driver in the pack, his stats paled in comparison to that of Busch (eight wins), Harvick (eight wins) and Truex (four wins). Having said that, look past the wins and Logano’s stats are more comparable to the other three drivers. Logano may have been quiet about it, but he really put forth a great season and he got even hotter at the right time. Yes, him moving Truex may have been seen as bad by some, but take the win away and Logano was going to be the fourth driver on points anyway. 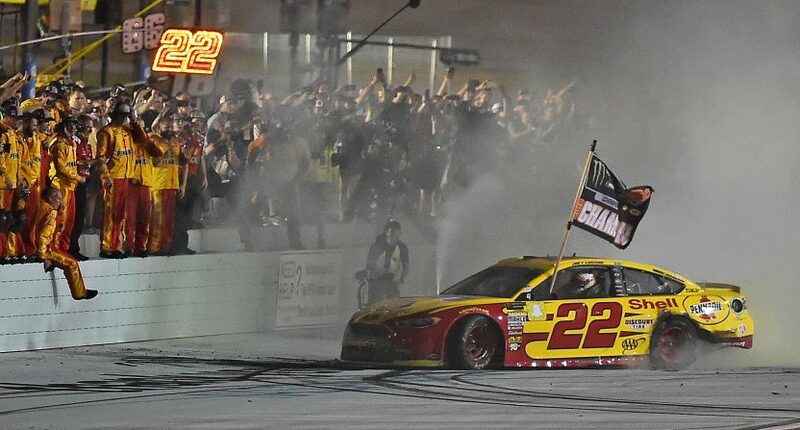 My point is that under this system where wins are seen as being more and more important, consistency can still be rewarded with a championship and Joey Logano did just that. Logano now has a championship to go along with his Daytona 500 win. Maybe Mark Martin was right, Joey Logano is the best thing since sliced bread.